These Quality Table Skirts that Stand Out are Perfect for Trade Show Use! Adorn Folding Tables with Shirred Throws to Attract More Visitors and Customers! Project Sophistication with These Unique Table Skirts! 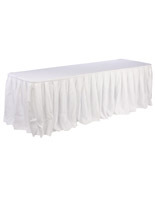 10' table topper covers a 6 or 8-foot-long folding table. Box pleated table skirt gives your table a classic and upscale look. Includes (10) clips that fasten to the table to attach table skirts. These table skirts, called tablecloths and covers, give 6 or 8 foot long folding tables a brand new appearance. Made from 100% polyester fabric, these covers are durable and last longer than other types of fabric. 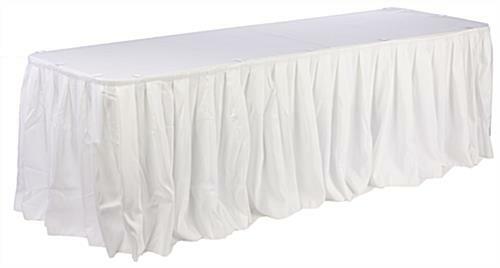 The white coloring makes the table skirts look great for use in banquets, hotels, wedding parties, trade shows, catered events, and other special functions. These linen throws come in a complete set. 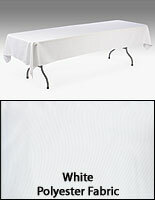 The entire banquet tablecloth covers set includes one white tablecloth, coordinating color skirting, and clips. 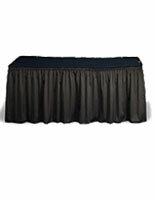 The box pleated table skirt will make any banquet table look presentable and elegant during all kinds of occasions. The polyester fabric is machine-washable and wrinkle-resistant, which allows users to employ it again for other functions. These tablecloths, table skirts are a great way to dress up tables easily and quickly without pins or staples required! The skirting features sewn-in hook and loop strips at the back to permit easy attachment to the clips. These table skirts are offered at a very low cost. 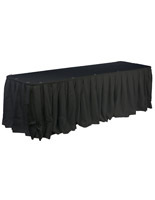 Since the banquet tablecloth covers cost less for you to own than rent, why not just buy them? !